Credit: Image by Jennifer Morrell-Falvey, Oak Ridge National Laboratory. OAK RIDGE, Tenn., Jan. 14, 2016--Researchers at the Department of Energy's BioEnergy Science Center are looking beyond the usual suspects in the search for microbes that can efficiently break down inedible plant matter for conversion to biofuels. A new comparative study from the Oak Ridge National Laboratory-based center finds the natural abilities of unconventional bacteria could help boost the efficiency of cellulosic biofuel production. A team of researchers from five institutions analyzed the ability of six microorganisms to solubilize potential bioenergy feedstocks such as switchgrass that have evolved strong defenses against biological and chemical attack. Solubilization prepares the plant feedstocks for subsequent fermentation and, ultimately, use as fuel. The paper, published in Biotechnology for Biofuels, is the most comprehensive comparative study of its type to date. "Starting with nature's best biomass-solubilizing systems may enable a reduction in the amount of nonbiological processing required to produce biofuels," said ORNL coauthor Brian Davison. "We're asking the question -- what are nature's best biocatalysts?" Their analysis demonstrated that under carefully controlled conditions, a microbe called Clostridium thermocellum is twice as effective as fungal enzymes used by industry today. The researchers also tested the different microbes' performance with minimal pretreatment of the plant materials, indicating it may be possible to reduce or eliminate use of heat and chemicals that make the feedstock accessible to biological processing. "Eliminating both enzyme addition and conventional pretreatment is a potential game-changer," said Dartmouth engineering professor Lee Lynd, the study's corresponding author. The researchers note that the study was designed to provide indications of intrinsic capability and performance under industrial conditions. They hope their findings will guide the development of advanced processes to lower costs and improve the efficiency of commercial biofuel production. "One of the directions that this study leads is that we might have to go out into nature to find the best bugs, even if they are not the ones we're most familiar with," Lynd said. "A major thrust in BESC is that we exclusively focus on these non-standard microorganisms that bring strong biocatalytic abilities to the table, rather than focusing on well-known microorganisms." The research team also considered the use of mechanical disruption techniques such as milling to complement the microorganisms' biological breakdown. The study is published as "Biological lignocellulose solubilization: Comparative evaluation of biocatalysts and enhancement via cotreatment." Coauthors are Dartmouth College's Lee Lynd, Julie Paye, Anna Guseva and Sarah Hammer; the National Renewable Energy Laboratory's Erica Gjersing, Mark Davis, Jessica Olstad, Bryon Donohoe; ORNL's Brian Davison; Thanh Yen Nguyen and Charles Wyman of the University of California, Riverside; and University of Georgia's Sivakumar Pattathil and Michael Hahn. BESC is a Department of Energy Bioenergy Research Center supported by DOE's Office of Science. 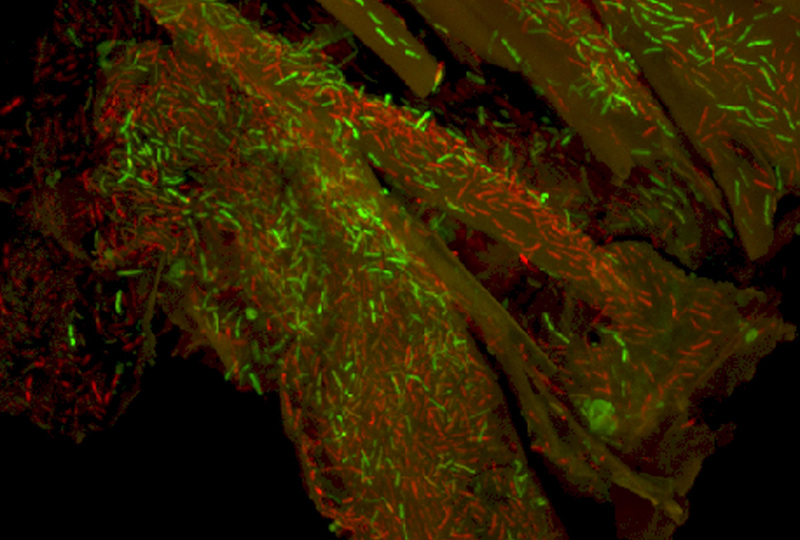 Caption: The microbe Clostridium thermocellum (stained green), seen growing on a piece of poplar biomass, is among several microorganisms recently evaluated in a BioEnergy Science Center comparative study. Image by Jennifer Morrell-Falvey, Oak Ridge National Laboratory.